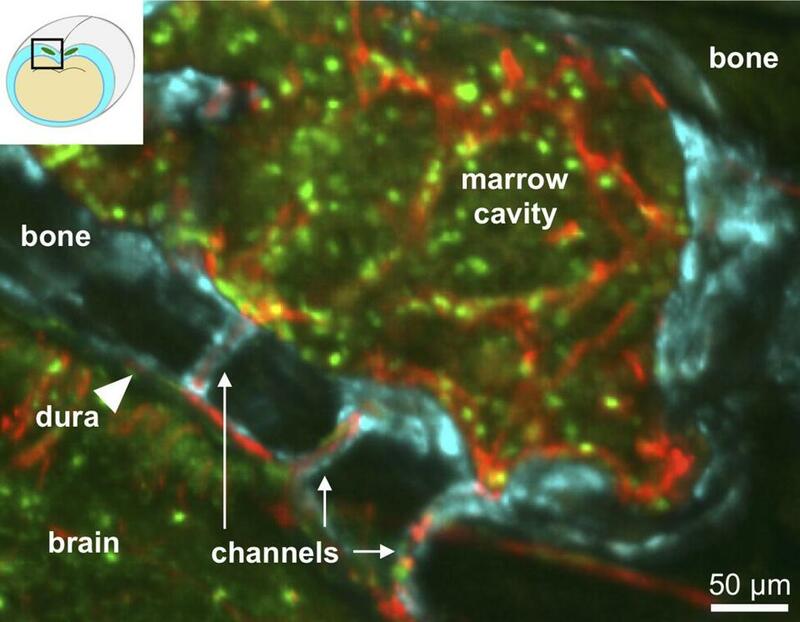 A microscopic view of the skull of a living mouse shows the channels running from the bone marrow to the dura, or outer membrane, of the meninges. Researchers at Massachusetts General Hospital say they’ve discovered previously unknown microscopic channels connecting the bone marrow in the skull and the meninges, the lining of the brain — and the finding could give them a better understanding of some diseases of the brain. They also say that immune cells responding to a stroke or other injury to the brain are more likely to come from bone marrow in the skull to the brain through the channels. “Until now, we thought that bone marrow throughout the body reacts uniformly to an injury or infection anywhere, but now we know that skull bone marrow has a special role due to its proximity to the brain and its direct connection to the meninges by microscopic channels,” Dr. Matthias Nahrendorf of the MGH Center for Systems Biology, senior author of the study, said in a statement. Bone marrow plays a key role in the immune system. But while inflammation is a key defense and repair mechanism of the system, it can get out of control and damage healthy tissues, researchers said. 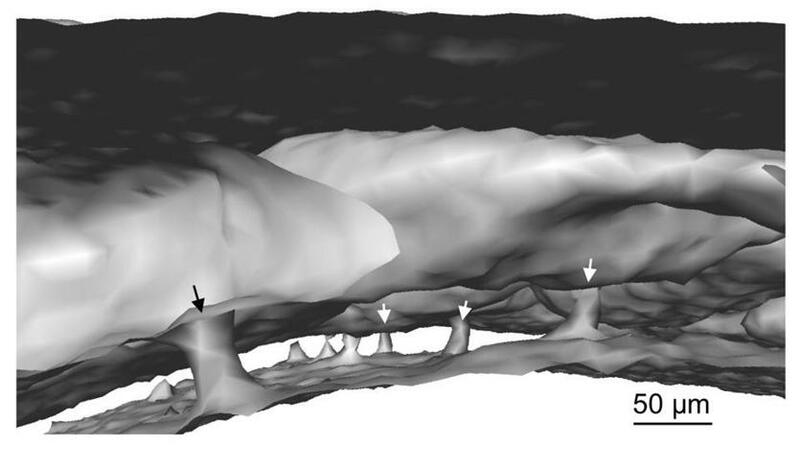 A micro-CT scan of the skull of a living mouse shows the channels coming from the bone marrow to the outer membranes of the brain. The channels provide a “migratory path for inflammatory neutrophils produced by the marrow that can actually damage the brain,” Nahrendorf said. The study, whose lead author was Dr. Fanny Herisson, is being published in the journal Nature Neuroscience. Narhendorf said the researchers want to investigate the “relevance” of the channels in inflammatory system diseases of the central nervous system, including acute stroke, hypertension, and Alzheimer’s disease. “Since many brain disorders have inflammatory components, it would be great to learn how the channels contribute to those diseases and whether modulating their contributions could change outcomes,” Nahrendorf said. He said the discovery could also open a new route for drug delivery to the brain lining via the skull bone marrow.